Edinburgh Maggie’s Cancer Caring Centres turned 15 this past week. Born from one woman’s idea of supporting those affected by cancer in a beautiful space, and with cancer support specialists, the Edinburgh centre was the first of 15 such centres around the UK. More are being built around the world as I write. Maggie herself, who died before the landmark Edinburgh centre was completed, would be truly stunned at her legacy. It is a remarkable place that means a lot to so many. As for myself, every time I step through the elegant, transparent front door I am suffused with a sense of calm. Even when I am running late and the rain is lashing down while I’m bringing in nutrition workshop bits and bobs, my breathing slows and my shoulders drop. The natural light, the colourful handmade cushions, the burbling of the ever-on kettle, and of course the wonderful volunteers and staff, make this building so welcoming. Like a beautiful friend who also happens to have a PhD in something useful, the Maggies’ Centres combine form and function to great effect. The occasion/achievement of turning 15 was marked with a day-long open-house event attended by I don’t know how many hundreds of people: a teensy bit like some fifteen-year olds’ Facebook -advertised birthday parties – minus the smuggled in alcohol and broken furniture. But unlike the parties our teens get asked to this one served soup (I made soup for 300), fresh bread and tables of delicious-looking home-baking. I say ‘looking’ because I didn’t get a chance to sample any. I was too busy getting a ‘soup sauna’, as wit and colleague Issy dubbed it, ladling out this and this. Volunteer Margaret did a fab job with the mental maths and money collecting while I ladled and chatted over my two 37-litre soup pots. It was a terrific atmosphere with lots of laughter, cake eating, and surreptitious ogling of Maggie’s Scotland rugby team calendar. And lots of ‘friends reunited’. I was also lucky enough to the next day attend the Scottish Cancer Prevention Network conference. With the unwieldy title ‘stacking the odds against cancer occurence and recurrence’ it was a useful and surprisingly upbeat day of updating my knowledge and meeting cancer research movers and shakers. Organised by the highly-regarded and warmly personable Annie Anderson, Professor of Public Health Nutrition at the University of Dundee, the conference wasn’t just a report of what’s happening in the field but also a push for us all to do more to improve our nation’s frankly appalling cancer statistics. Challenging to say the least. Even the Deputy Chief Medical Officer for Scotland, Dr Aileen Keel, was forthright in her assessment of the current situation and of the difficulties in bringing about meaningful and sustainable change. Perhaps the best thing that day was the personal story of Glynnis, and her experience of bowel cancer diagnosis and treatment. She had a wonderful sense of humour about herself and her disease, but she also made acute points that will no doubt cause all in attendance to want to do our respective jobs that much better. 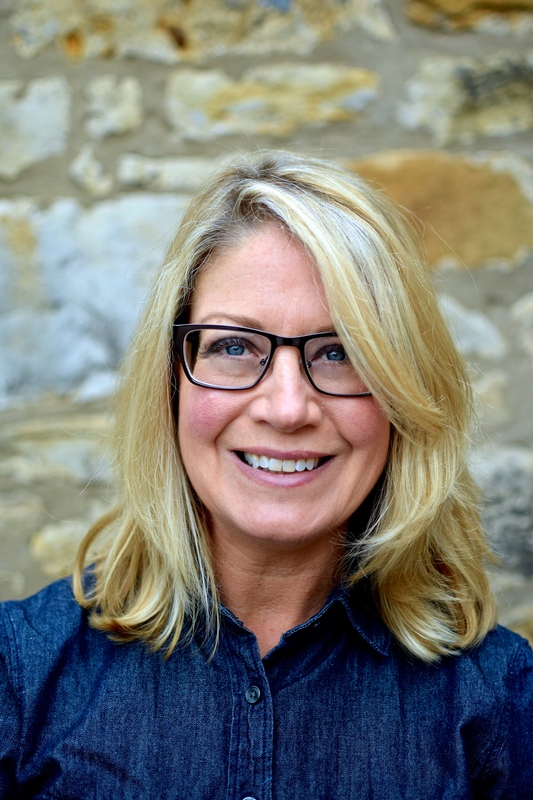 Her story, and the sobering statistics flashed up throughout the day, certainly has reinforced my personal and professional mission to eat more fibre, eat more colour and not delay going to the GP with any suspicious symptoms. How about making it a goal to know more about reducing your risk of cancer? The newly revamped bowelcanceruk.org website is a great place to start, as is the aicr.org and wcrf.org sites. 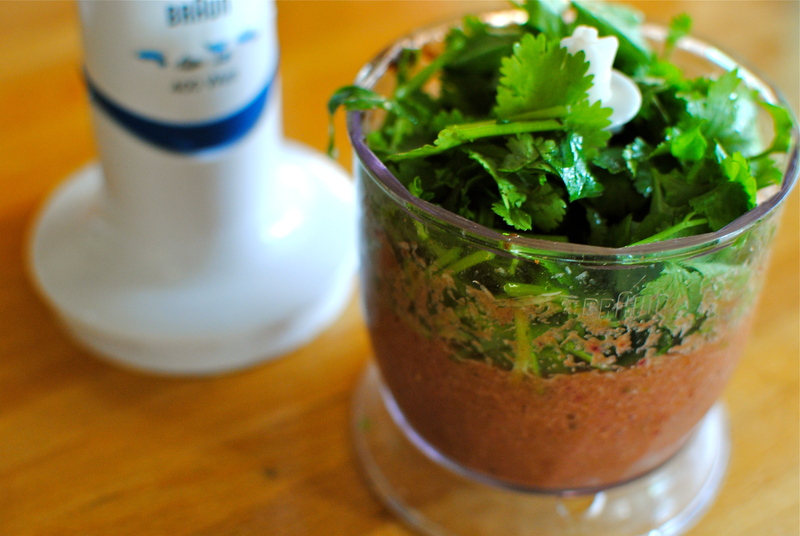 Today’s recipe is a celebration of colour, lip-smacking taste and of well-disguised nutrition. I was actually daydreaming of this soup while eating my buffet-snaffled vegan (half) sandwich and handful of grapes. I was decidely hungry but as the conference lunch immediately followed some pretty up-front obesity and cancer statistics, I dared not go too wild with the walnut and something or other sandwiches. I think that night I fixed some steamed fish and plain vegetables for my poor family. What was I thinking? It wasn’t even as if Madonna was coming over. Eating healthily doesn’t and shouldn’t be about punishment and unadorned vegetables. Food should be enjoyed, and bring joy. Making this dish and sharing it with others, whether family, friends or both, is a joy to me. This laksa is incredibly healthy but feels so celebratory to slurp. I hope you enjoy my modest version. Like many dishes that have been around seemingly forever, it is difficult to trace the origin of curry laksa – or laksa as it is often called. The word origin too has been lost, although the Hindi word for vermicelli – ‘lakhshah’ – seems a likely contender. What’s fairly indisputable is that the dish itself originates from Malaysia. Neighbouring Singapore and Indonesia also do versions. Delicious imaginings of this dish are extremely varied, but commonly have noodles and a spicy, thinnish coconut broth as the mainstays. Many have fish and seafood like cockles, as these are the most common proteins available in this region, but some have chicken and many also include deep-fried puffed tofu as an add-in or as the primary protein. Vegetarian versions are not unusual, but liberties may be taken with the definition of vegetarian. 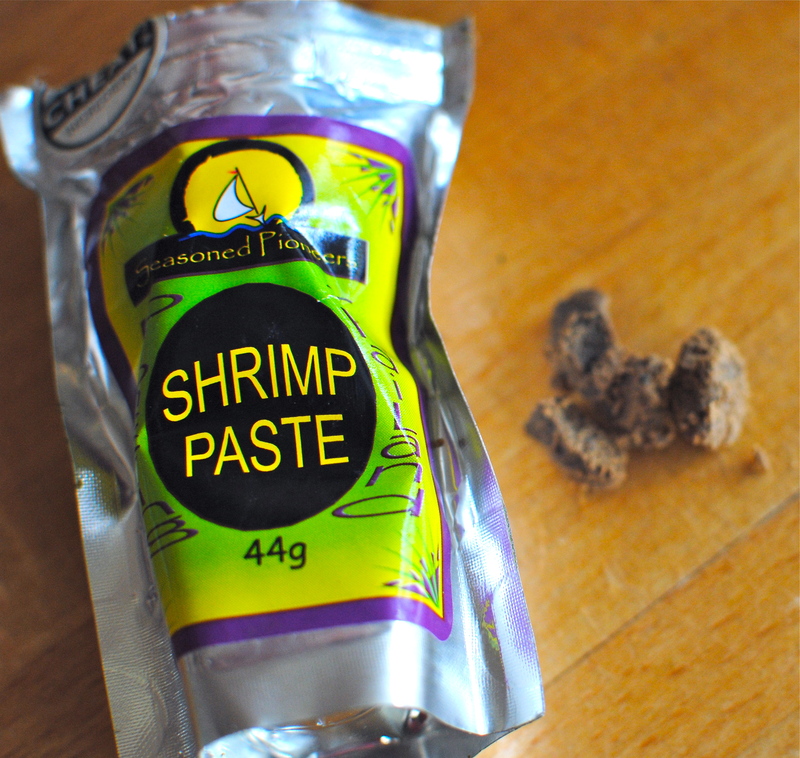 Two words – shrimp paste. In Malaysia laksa curry is considered ‘hawker’ (street) food, so it isn’t often made by the home cook. But luckily for us this deliriously flavoursome soup can be reasonably approximated from the contents of a reasonably well-equipped kitchen and shop. And employing reasonable chopping skills (lots of julienning if you want to be authentic). Super authentic recipes are on the Internet involving blanched candle nuts and special fish cakes but this recipe, and versions thereof, is the one I use most often. I adore Malaysian food – well all southeast Asian food – but this is the only dish I make at home on a regular basis, when time is short and temper shorter. It is so easy and tastes like you’ve pounded, whisked and chopped for hours. But you haven’t. Hooray! My little laksa is not strictly vegetarian as it calls for optional shrimp paste, which I think adds a special something. You may disagree. 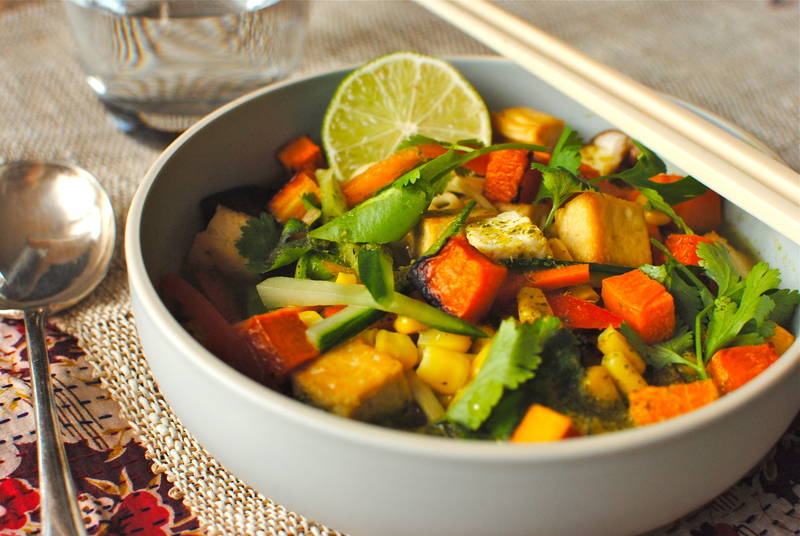 A veggie alternative would be yellow bean sauce – it’s closest approximation. And as with a lot of my dishes use whatever vegetables that seem good and appropriate to you. I haven’t put green beans in the recipe, but these could go in, and sweet broccoli stems too (save the florets for something else), as could sweet potatoes or even white potatoes, instead of the slightly more fussy butternut squash. A key for me is the near-rawness of most of the ingredients, but cook them a bit more if you like, garnishing with cooling, raw cucumber strands (like green, liquid noodles), thick wheels of lime and punchy coriander – stalk and all. As for the noodles, I didn’t have brown rice noodles for the photo opportunity but I would recommend them for their quickness. 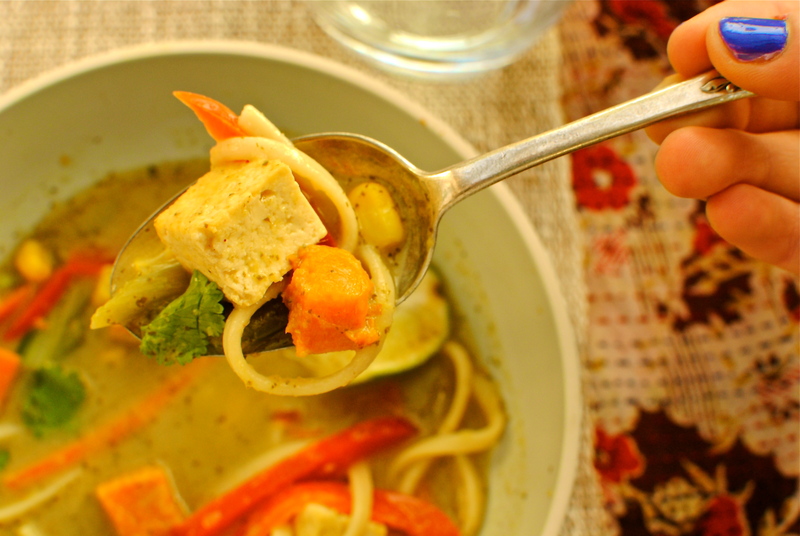 I used buckwheat soba noodles, cooking them in the broth mix for a few minutes before adding the vegetables and tofu. I wish I had shown more of the broth as that’s really how to eat it but I guess I was anxious to ‘show-off’ the colourful vegetables. But it’s really about the broth. It’s real bowl scraping stuff. Warning; the ingredient list may turn off the casual reader of this recipe, but it really is so easy if you have a blender or mini chopper/processor. The key is the the prep. And worth every pre-prandial moment. Whether you make your own paste (you just bung the ingredients into a blender) or buy one I guarantee that eating this soupy curry will put a satisfied smile on your face. Don’t be put off by the list of ingredients or instructions; it’s not a stressful dish to make. Just be sure to have everything to hand as it is essential (to me anyway) that the vegetables retain their ‘bite’. Blitz all the paste ingredients in a blender or mini food processor; you want to be sure the lemon grass is pulverised. Set aside. If you will be storing it, cover it with a layer of rapeseed oil and refrigerate in a covered bowl, or in a lidded jar, for up to three days. When you are ready to make your soup, cube the butternut squash and decant onto a baking sheet you’ve sprayed with oil spray (or brush the sheet with a little olive oil). Bake at 180C for 15 minutes. Add the tofu pieces and bake both for a further 10 minutes. Remove from the oven. If the butternut squash is baking quite quickly remove them as they start to darken. In a large saucepan bring the stock to the boil. Whisk in the paste (or 1/2 jar of ready-made paste, which is normally quite concentrated), coconut milk and add the peas, carrot, mushrooms, sweetcorn and noodles. Simmer for three minutes. Add the tofu, squash, peppers and spring onions. Make sure everything is hot before serving. Top each bowl with chopped coriander and cucumber shreds. Hand round lime wedges for those who want extra freshness. If you have any spicy sambal sauce feeling lonely in a cupboard – or even the fashionable sriracha – get that out too. 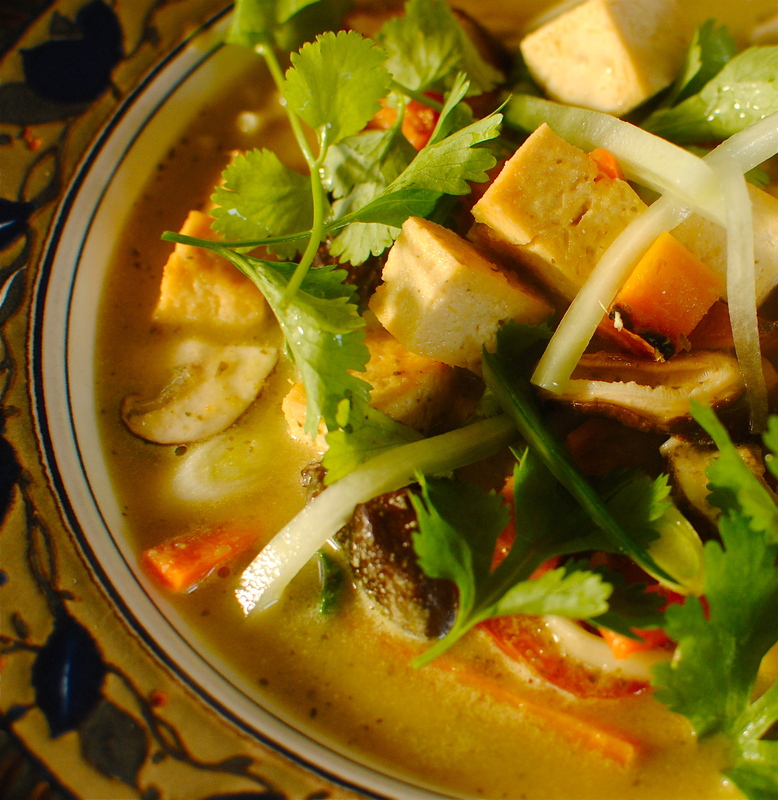 Curry laksa makes great leftovers too. Serves 4 large bowlsful with some leftover for later. Less:Do not add the coconut milk – this will make for a spicier soup (stir in 100 ml reduced-fat soya milk per bowl just before serving if too spicy for your palate) but is actually really fresh tasting like this. I like both methods equally. Nutrition notes: This dish has so much going for it that it is difficult to single out just one or two star ingredients and nutrients. If forced to choose I would say the immune-boosting properties of the paste mix make it a stand out. 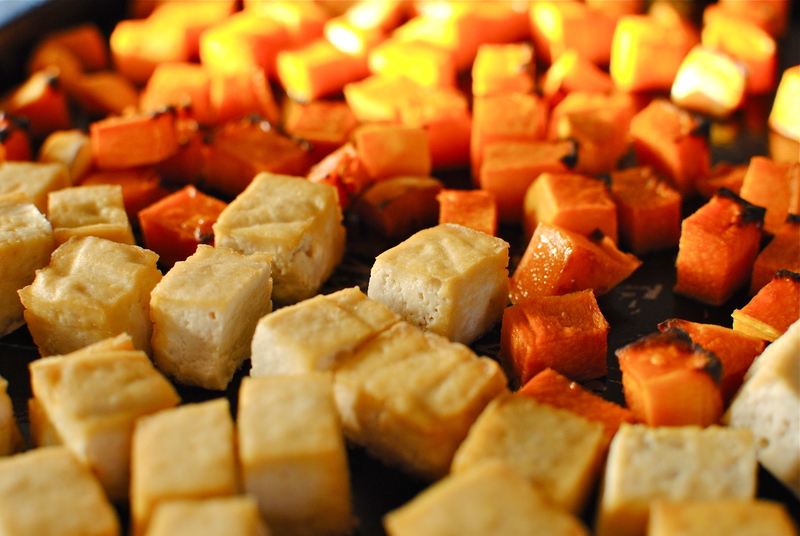 But then again the roasted butternut squash gives a good beta-carotene hit, and the tofu is full of calcium and protein. 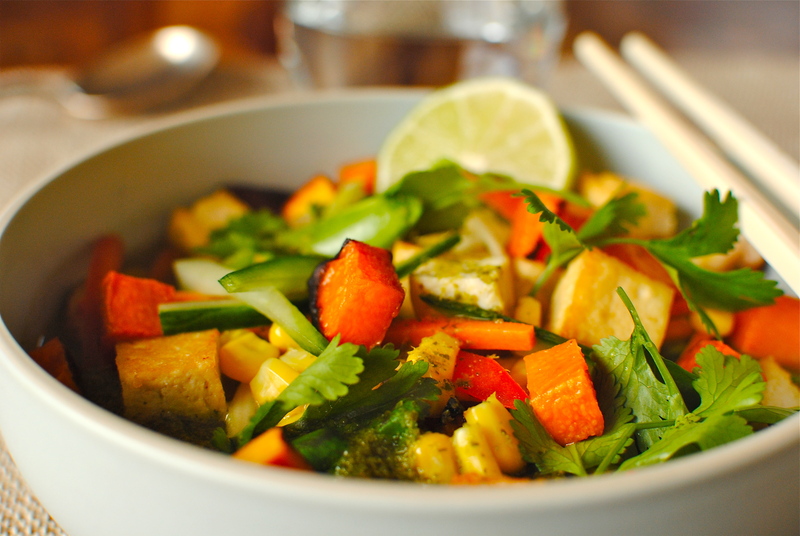 All round it is a top dish for combining tongue-tingling taste with immune and energy-boosting ingredients. Kellie, you just do everything so well, wonderwoman! Your fotos’ arer absolutelly marvellous as is your food and your writing……. Wow! You were quick off the mark ChileQueen! I bet you will put in ‘proper’ chiles and take it up another level. It was great to see you on Tuesday, even though we didn’t have time to have a chat. I (and the family) are soo… into Laksa that it it is a weekly meal in our household. I do urge people to try it especially with coconut milk. In Malaysia the coconut is considered a superfood. It sounds as though the conference went well, and the birthday party. What a busy week you had! Sorry I couldn’t make it. Thanks for your coconutty advice Catherine! I would always add coconut milk, and not the reduced fat stuff which often has a weird, carageeneny texture. I’m sure the Malaysians wouldn’t approve of low-fat 😀 Hope you are mending nicely and decide to come up to Edinburgh sometime soon. 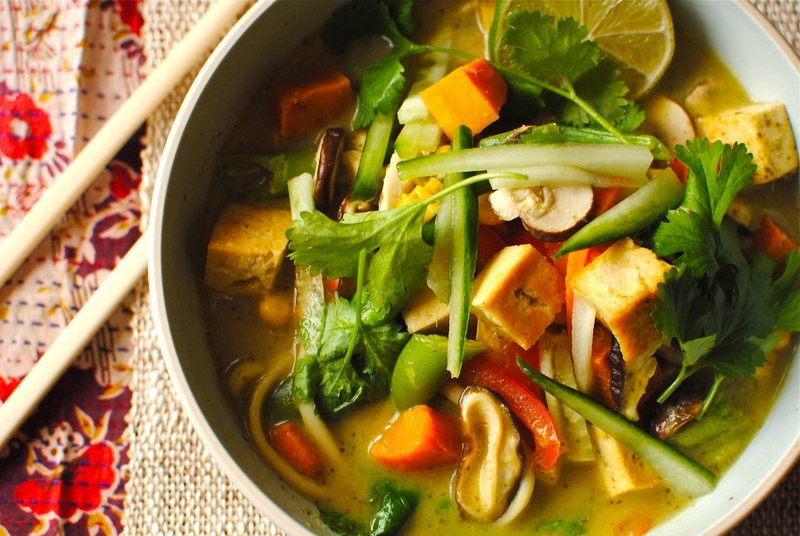 What veg do you add to your laksa? Lovely post and super photos too……and all in a GREAT cause! To be honest we use any veg to hand – basically anything that could go in a stir-fry including cabbage or pak-choy. The boys like it served with a salmon or tuna steak but I think tofu is perfect. I can imagine that tofu wouldn’t be a huge hit with teenage boys 😀 I tend to use any veg too: if you have the paste in the freezer I think it’s a great way of answering the age old question, “what’s for dinner?” PS My notes on the conference are rubbish but Annie said they would be on their site. Wow! Absolutely gorgeous soup! I could have used some last week when I was sick, although I did manage a bowl of Thai soup that helped clear out my sinuses. I’m definitely saving this recipe for a rainy afternoon soup making session! Congrats to the Centre on turning 15! Yes, definitely take it as a sign. This is one of my absolute favourite things to make & eat this time of year. Sometimes we make it hot, other times quite mild & restorative. 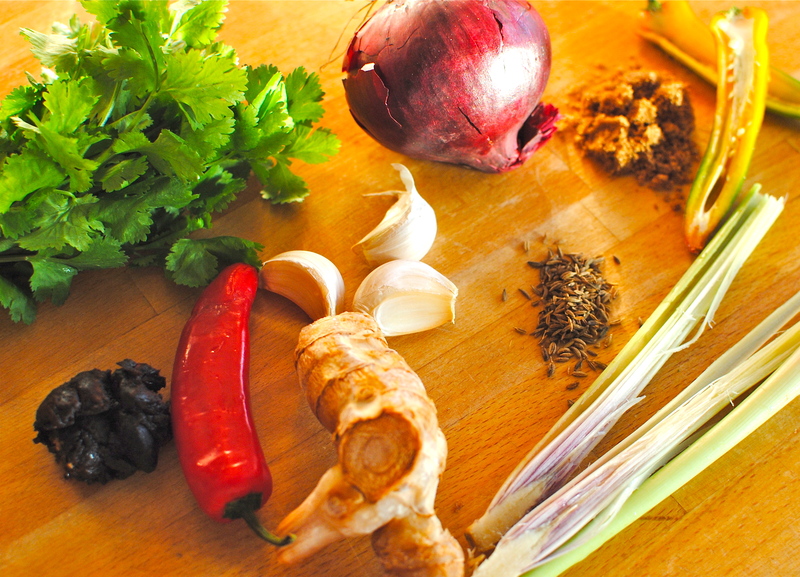 Hope you make a curry laksa soon! 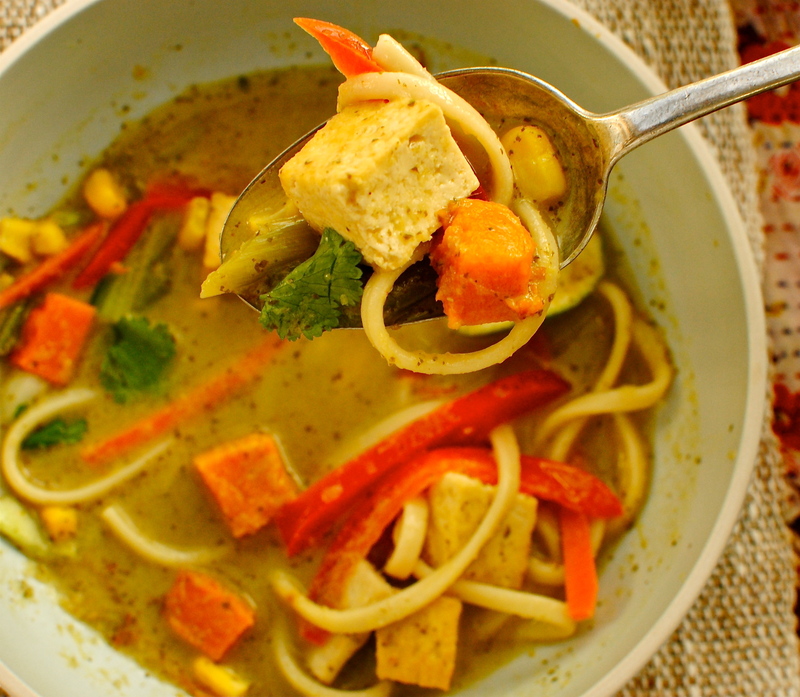 This Laska has some of my favorite flavors and spices – yum! Thanks so much, Jeanette. I like savoury, slightly spicy foods & this is a family favourite. Quite versatile with protein choices & veg too. Hi Kellie, found your blog through Jeanette on Twitter. Wonderful recipes! I’ll be back often. I’m really excited to make this over the weekend, but I see turmeric written in the ingredients list for the paste twice.. I’m guessing this is a simple typo; please can you tell me what the two occurrences should actually be?